• 146 sq. 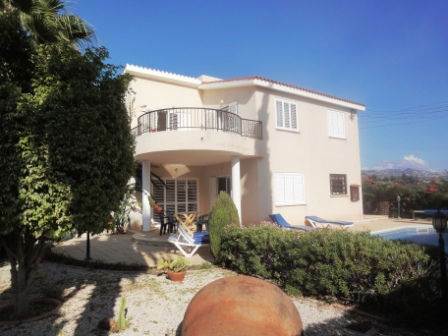 m., 3 bath, 3 bdrm 2 story - €250,000 EUR - Price Just Reduced!! Coral Bay, Paphos - This impressive villa sits on a corner plot in a quiet residential cul-de-sac in Coral Bay, one of the most popular areas of Paphos to live or holiday. The sandy beaches and wide variety of restaurants are within easy walking distance. The ground floor features a spacious open plan L shaped living room, nicely arranged into a comfortable lounge and dining area. Patio doors provide easy access to an outside covered terrace, which is positioned to the side of the swimming pool, and overlooks the beautifully landscaped gardens, and bordering green area. Off the dining room is a good size separate kitchen with plenty of cupboard and worktop space, and patio doors leading to the outside. Near the entrance is a guest cloakroom, and staircase leading up to a large landing with arch windows and an ideal study/office area. Off the upstairs hallway are three double bedrooms with fitted wardrobes, and a good size family bathroom. The master bedroom also has the character arch windows, and a modern large en-suite with fitted double size shower and tiled base. Patio doors from the master and second bedroom open onto a large round shaped balcony with lovely views of the sea and surrounding countryside. A special place to watch the stunning sun set! Outside, the swimming pool area is screened by colorful shrubs, hedges and bougainvillea. By the driveway is a large wooden shed, which is ideal as a workshop area or storage room. All in all, this property has huge appeal, and is highly suitable as a family home or holiday retreat. The furniture is included in the price, and there are full title deeds. Please refer to MLS#: 1301 when inquiring.